Already well known as a talented guitarist, Niko Tsonev profile was raised by stepping up and becoming the touring guitarist and member of John Young’s Lifesigns project, and whilst his guitar was missing from their debut album he toured with them from 2013 – 2016 becoming an integral part of the bands sound, and appearing on their successfully crowd funded live CD/DVD package ‘Under the Bridge’, and guests on their second release ‘Cardington’. Stepping away from the Lifesigns, Niko has thrown himself into his latest project Moonparticle, and as a guitarist and performer of his calibre he could pretty much pick and choose who he works with, this means the band is full of talent like Craig Blundell on drums, Theo Travis on flute, Adam Holtzman on keys and Grog Lisee adding the female touch with her superb vocals. Former Steven Wilson Band / Lifesigns guitarist Niko Tsonev has announced a new band project, Moonparticle, and has launched a Pledge campaign to fund the band's forthcoming album. Joining Tsonev in the project are Steven Wilson band members Craig Blundell (drums), Theo Travis (wind instruments), Adam Holzman on keyboards as well as vocalist Grog Lisee. "The album is full of eerily beautiful vocal performances, guitar heroics, synth wizardry, jazz chords and prog electronica beats, but above all there are songs that take you places," Tsonev told Prog. 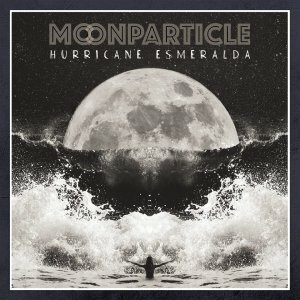 Recorded between January and July 2017, Moonparticle’s debut was funded by a successful PledgeMusic campaign. The recording took place in various locations - essentialy each musician adding their contribution from their own recording studio (London, Paris, New York and Los Angeles) via online file sharing. Produced and mixed by Niko Tsonev, the album was mastered by Jon Astley (Paul McCartney, Peter Gabriel, Porcupine Tree). The artwork and graphic design were conceived by digital artist Be Wilde. The title ‘Hurricane Esmeralda’ was inspired by themes of inner awareness and growth, and the process of pure creation. The virtuoso level of musicianship displayed by the aforementioned musicians throughout the 40 minutes of music, complements the primary focus of the album - inspired songwriting and brave musical performances.